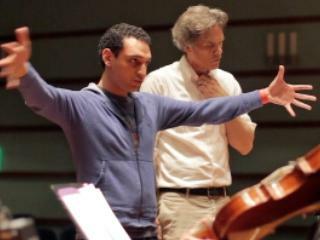 Composer Mohammed Fairouz, working with musicians at Grinnell College. A young composer who is seen by many as an up-and-coming talent will soon have his new piece performed on the East Coast. His work was written for and premiered this spring by the Grinnell College choir. It combines the unlikely pairing of Irish poetry about Iowa with biblical passages about an apocalypse sung in Arabic.